Collaboration of the Czech (PAF) and Norwegian (Screen City) Platforms for Film and Contemporary Art of the Moving Image. The press conference for the project will take place in the Czech Republic with the participation of the Norwegian partners (Screen City Festival, Stavanger) and representatives of PAF Olomouc. The conference will be preceded by a team meeting and followed by several programme events. The purpose of the conference is to present the theme, the main goals, the artists and the individual phases of the project as they will be implemented for the public. The focal points of the “Laboratory” of Live Cinema were the visits to multimedia studios in the Czech Republic and Norway, the presentations, the preparation of the programme and the production of audio-visual performances and installations. The specific projects commissioned for the festivals Screen City (15.–18. 10. 2015) and PAF (3.–6. 12. 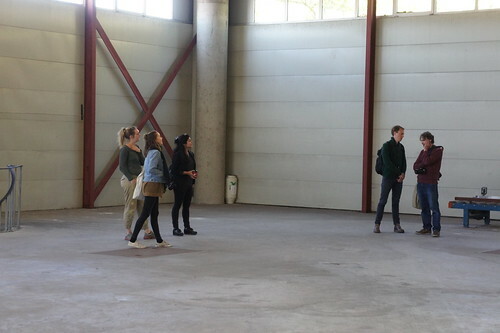 2015) were articulated during discussions with artists and curators. Discussion between artists and curators, studio visit. 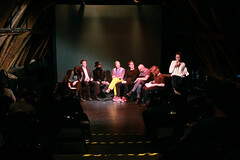 Curators and theoreticians: Martin Mazanec, Daniela Arriado, artists: Matěj Al-Ali, Tomáš Moravec, Martin Búřil, Dušan Zahoranský, Dan Gregor, Dominik Gajarský. Field research. Dialogues with experts on Norwegian art, culture and music scenes and with organizers of cultural events. Visiting selected distributional hubs and cultural events. Meetings and debates with artists, meeting and training at Videokunstarkivet and Atelier Nord. Curators and experts: Martin Mazanec, Marie Meixnerová, Alexandr Jančík, Petr Svárovský, Linda Våge, Ida Lykken Ghosh and others. Artists: Monica Winther, Alexander Rishaug, Lars TCF Holdhuss, Niels Henrik Alsheim and others. A series of lectures and seminars linked to the issue of film relocation. In cooperation with Palacký University, Olomouc. 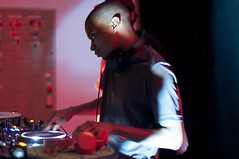 Norway-based visual artist Greg Pope introduced his methods of audio-visual performance preparation. The seminar included the first public presentation of the fragments of Stone Horizon, a new work by Greg Pope in collaboration with Czech artists Kateřina Koutná and Veronika Vlková. The second What is Live Cinema seminar targeted the phenomena of electronic and acoustic music in live performance and was given by Kateřina Koutná (aka Makak). 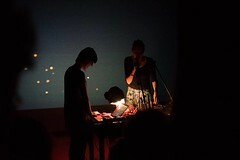 She subsequently performed a live cinema show with the visual artist Anna Balážová. The lecture given by Czech theoretician Tomáš Pospiszyl focused on the phenomenon of Laterna Magika in the context of international exhibitions. Martin Blažíček and Katarina Gatialová: What is Film? The visual artist and pedagogue at FAMU, Prague, in dialogue with art historian and head of the department of digitalization and new media at the National Museum in Prague, Katarina Gatialová. In long terms, Martin Blažíček deals with the transitions of the moving image of film and video – from the live cinema to the cinema which is live coded. Dominik Gajarský and Martin Mazanec: What is Film? The visual artist and musician who graduated at Academy of Fine Arts, Prague, Dominik Gajarský, in dialogue with PAF programme manager and curator Martin Mazanec. Dominik Gajarský concentrates mostly on the media of video, film and photography. The theme of his current exhibition in the Prague City Gallery is Carausius morosus. Barbora Kleinhamplová and Karina Kottová: What is Film? The visual artist Barbora Kleinhamplová, graduate of the Film and TV School of Academy of Performing Arts in Prague and of the Academy of Fine Arts, Prague, and the present laureate of Jindřich Chalupecký Award in dialogue with curator Karina Kottová, who is the director of Jindřich Chalupecký Award. In her videos and installations, Kleinhamplová uses performative situations to illustrate the “social engineering”. Preparation of audio-visual installations and performances based on Live Cinema Lab. Authorial participation by the following artists: Dan Gregor, Michal Pustějovský, Martin Blažíček, Tomáš Moravec, Matěj Al Ali, Kateřina Koutná, Veronika Vlková, Niels Henrik Alsheim, Greg Pope. A day prior to the opening of the Screen City Festival, the Czech artistic duo of Tomáš Moravec and Matěj Al-Ali gave a lecture focusing on their authorial approach to Live Cinema. They also presented their joint site-specific live cinema project prepared specifically for the Screen City Festival in Stavanger under the umbrella of the Festivals of Live Cinema project. Discussion and presentation of the Czech and Norwegian implementation team with invited experts from curators and artists. Presentation of the “preparatory laboratory” Live Cinema Lab, its outcomes for the Stavanger festival as well as the works prepared for the December festival PAF in Olomouc. A press conference for the 14th PAF—Festival of Film Animation and Contemporary Art. The conference spokesmen were festival director Alexandr Jančík, main programme manager Martin Mazanec and programme managers Jiří Neděla and Marie Meixnerová. 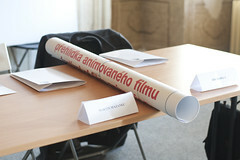 The aim of the conference was to introduce the festival program and program blocks under the umbrella of the Festivals of Live Cinema project. 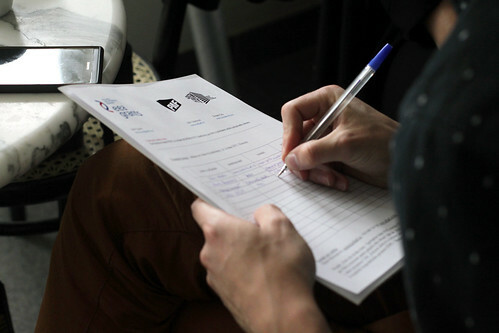 Special emphasis was placed on the presentation of the progress of the Festivals of Live Cinema project and the activities conducted so far, as well as the unique artworks and lectures commissioned within the project. The presentation of an artistic creation which transforms into a composition intended for a baroque chapel. Unpredictably flowing ambient areas meet abstract rhythmical structures and thus they form impressive sonic landscapes full of surprising moments and sound coincidences. The live cinematographic performance composed of a series of slides and epically phased music was created in Norway by the British filmmaker Greg Pope in cooperation with Czech musical artists Veronika Vlková and Kateřina Koutná, using the artistic pseudonym Salvia. 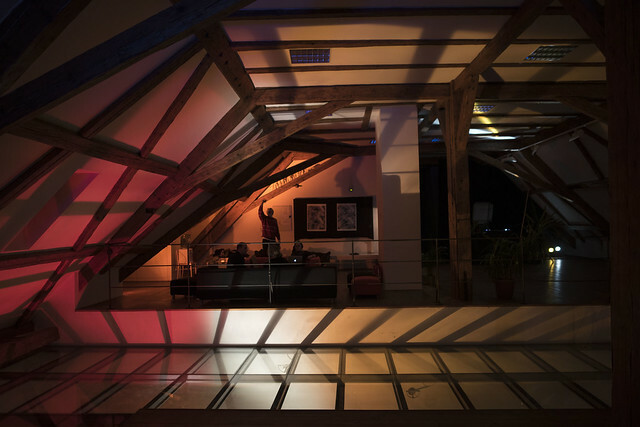 PLAIN is a new audio-visual project by Jonatán Pastirčák and Ján Šicko, a real-time audio-visual spatial landscape. 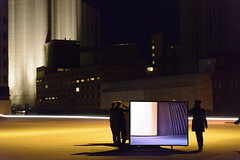 The project follows the Project for Orgell Natt that was created for Screen City in Stavanger. Presentations and lectures were held during PAF that dealt not only with the history of the Live Cinema phenomenon, but also with other related phenomena that were introduced by the leading Czech and international theorists and artists. The screening block maps the manifestation of animation in the collection of contemporary films and videos created on the basis of installation or audio-visual performance. The work of James and John Whitney will be presented by Martin Čihák, film avant-garde historian and film editing morphologist. He sees the work of both filmmakers as being in the area of absolute film, where the camera and the film reel are used as the recording media, while an abstract world is created in front of the camera. Within the Festivals of Live Cinema project, Other Visions of the moving image are visions Differentiated— clearly defined and distinctive works that are either, by means of their visual qualities, narrative structure, a combination of both or by any other means, inclined to the space in-between; or which through the various formats of their presentation expose different semantic levels that are supported by (or tied to) the chosen projection and installation situation. Supported by grant from z Iceland, Liechtenstein and Norway. Project partner is Screen City.